TEHRAN — More than 200 people were killed and hundreds more injured when a 7.3-magnitude earthquake shook the mountainous Iran-Iraq border triggering landslides that hindered rescue efforts, officials said on Monday. The quake hit 30km southwest of Halabja in Iraqi Kurdistan at around 9.20pm (1820 GMT) on Sunday, when many people would have been at home, the US Geological Survey said. 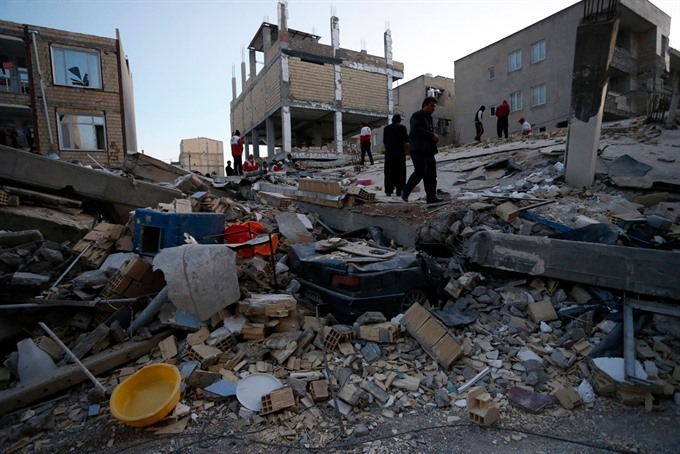 "There are 207 dead and around 1,700 injured", all in Iran’s province of Kermanshah, Behnam Saidi, the deputy head of the Iranian government’s crisis unit set up to handle the response to the quake, told state television. Mojtaba Nikkerdar, the deputy governor of Kermanshah, said authorities there were "in the process of setting up three emergency relief camps". Iran’s emergency services chief Pir Hossein Koolivand said it was "difficult to send rescue teams to the villages because the roads have been cut off... there have been landslides". "Four people were killed by the earthquake" in Darbandikhan, the town’s mayor Nasseh Moulla Hassan said. A child and an elderly person were killed in Kalar, according to the director of the hospital in the town about 70km south of Darbandikhan, and 105 people injured. The quake, which struck at a relatively shallow depth of 25km, was felt for about 20 seconds in Baghdad, and for longer in other provinces of Iraq. It was also felt in southeastern Turkey, "from Malatya to Van". In the town of Diyarbakir, residents were reported to have fled their homes. The quake struck along a 1,500km fault line between the Arabian and Eurasian tectonic plates, a belt extending through western Iran and into northeastern Iraq.